I’m not sure how we missed this, but we did. Class 40s traditionally don’t do well on IRC, especially when sailed double-handed against fully crewed crewed boats. The Mussolo 40 team however turned reality on its head when they finished fourth overall on corrected time in this years Cape to Rio Race. 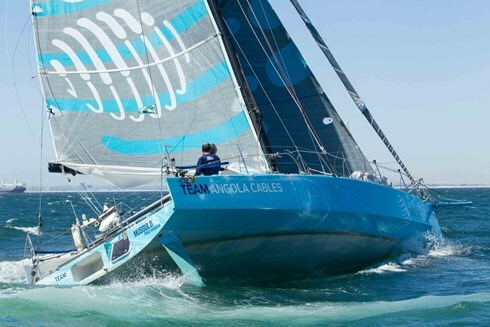 Finishing in a time of 16 days, 14 hours, 22 minutes and 12 seconds, Angolan doctor José Guilherme Caldas and Brazilian sailer Leonardo Chicourel also managed to beat the double-handed record previously held by the Farr designed Class 40 Privateer. Sailing as " Team Angola Cables" , Mussolo 40 is the ‘ex 40 Degrees 2’,launched in 2009 and originally owned by British sailor Peter Harding, designed by Owen Clarke Design with Clay Oliver and built by Jaz Marine in South Africa. "We competed well against larger boats with professional crews and are proud of how we did given some obstacles," said Caldas. "It was a tough race, but we persevered thanks to the support of a great team on both sides of the Atlantic."